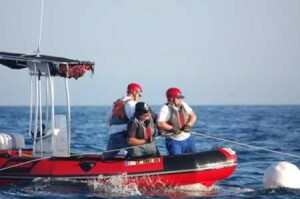 Would-be rescuers on Tuesday track June, a whale entangled in fishing gear who disappeared overnight. Rescuers, forced by nightfall to quit efforts to cut lines entangling a whale spotted near Laguna Beach on Tuesday, were unsuccessful in locating the 40-foot gray again by Thursday. The animal was last seen heading west into deeper and potentially more dangerous waters for rescue crews. 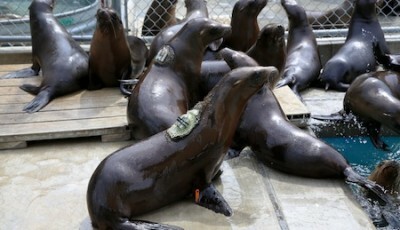 It could also have continued its migration to Alaska, according to a statement by Melissa Sciacca of Laguna Beach’s Pacific Marine Mammal Center. 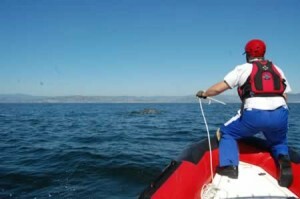 The entanglement appeared to be a relatively new injury, and was not deeply imbedded, according to Dean Gomersall, who led the PMMC rescue crew. Nevertheless, the Pacific Marine Mammal Center and its partners will continue the search and will partner with other licensed stranding centers should the animal be located outside of Orange County, PMMC officials said in a statement. U.S. Coast Guard helicopters joined the hunt on Wednesday to relocate the whale, last seen near the San Onofre Nuclear Generating Station. A PMMC rescue team successfully cut away 120 feet of rope that was impeding the animal on Tuesday and successfully attached three buoys to the entanglements that remained, Sciacca said. “It is a big whale, but it is also a bigger ocean,” said Leslie Kretschmar, a program director at Dana Point’s Ocean Institute, which participated in the rescue effort. “They did their best to mark the whale, but now it is a question of being at the right place at the right time. 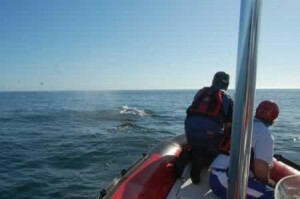 To my knowledge, there is no tracking device on the buoys that would help us to find the whale,” Sciacca said. The center’s rescue team, consisting of leader Dean Gomersall and volunteers Dana Friedman and Scott Sedlick, and spent Wednesday anxiously waiting to be called back into action. 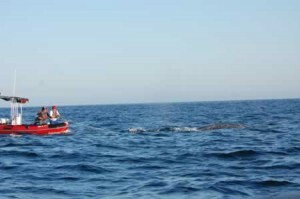 Friedman expressed frustration that the whale, which rescuers nicknamed June, eluded Coast Guard patrols by boat and helicopter. This week’s partly successful rescue effort was the third in less than four weeks by the Pacific Marine Mammal Center, dispatched to try to disentangle the imperiled creature with the authority of the National Marine Fisheries Services. According to PMMC volunteer Friedman, a member of the two previous rescue crews and active at the center since 1995, June could be miles away from where June was last spotted. During a similar scenario on March 28, when a crew renewed their efforts to disentangle a whale after quitting overnight, the entrapped whale had drifted to Redondo Beach from Newport Beach. “It is really frustrating and mentally exhausting for every member of the team to wait without being able to finish the job,” Friedman said Wednesday night. “No one from the team went on a boat on Wednesday. We all went to our normal job waiting for a call that never came. Now we hope some commercial boat or some random helicopter will find June,” he said. Ben Bodart is an intern from Belgium. 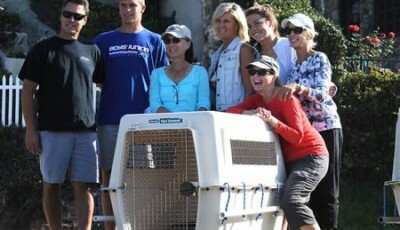 Best of luck on the rescue! 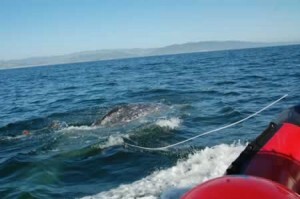 Freeing a whale entangled in fishing gear sounds rather dangerous. However, it is really brave of the rescue crew to volunteer for such a risk affair. Hopefully, no one will be hurt and the rescue efforts will bear fruit.